If there's one thing better than being asked to take part in a cover reveal - which is a seriously cool thing anyway - it's being asked to take part in a cover reveal for a book I've read and loved. If there's one thing better than being asked to take part in a cover reveal for a book I've read and loved, it's being asked to take part in a cover reveal for a book I've read and loved with two of the best bloggers around, Laura from Sister Spooky and Jesse from Books 4 Teens! 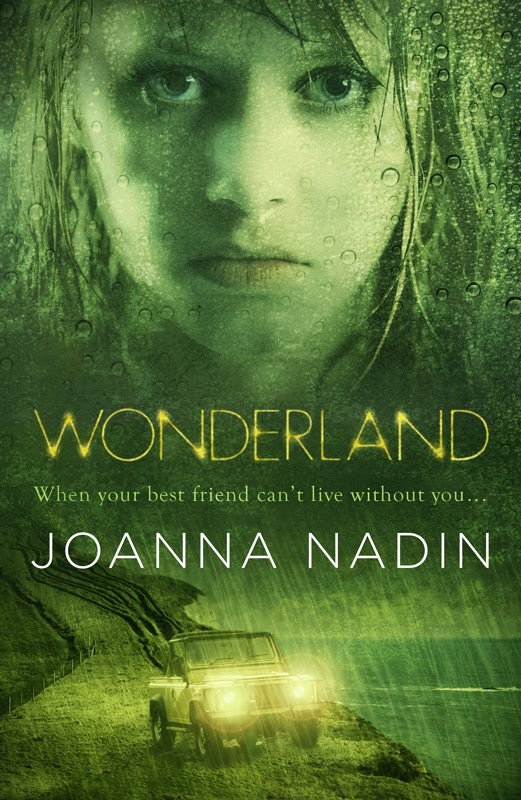 So when Annalie from Walker got in touch with the three of us to suggest hosting a simultaneous cover release for Joanna Nadin's awesome looking new book Eden, and new covers for her previous brilliant novels Wonderland and Undertow, I was hugely excited, and sent an e-mail back trying to stake a claim to the fabulous Wonderland. Luckily, I got it. Be yourself, they say. Be whoever you want to be. Dad, Ed, Mr Hughes, Oprah bloody Winfrey. Like some crappy mantra. But they’re not the same thing. Not the same thing at all. I look at my reflection in the rearview mirror. My hair packet-bleached and salt dirty, my eyes ringed in black, lips stained red. My hands on the steering wheel, white, the nail varnish chipped, weeks old. Then I look at the Point falling away in front of us. The wooden fence, broken from where we’ve climbed over it so many times. The ledge below, cigarette-strewn and soaked in lager. And the sea below that. A swirling, monstrous, beautiful thing. Alive. Nausea rises in me again, bubbling up, insistent. I breathe in, pushing it, willing it back down again. I don’t know how we got here. How I got here. I don’t mean how I got to this place, the Point, but how I became the girl in the mirror. I don’t recognize myself. What I look like. What I’m doing. I used to know who I was. Jude. Named after a song in the hope I’d stand out and shine. But I didn’t. Jude the ­Invisible. Jude the Obscure. Everything about me unremarkable. Nothing beautiful or striking, to make people say, You know, the girl with that hair, or those eyes. I was just the girl from the farm. The one with no mum. I knew what would happen when I woke up, when I went to school, when I came home. Who would talk to me. Who wouldn’t. Until Stella. Now when I look in the mirror I see someone else staring back. I can’t see where I stop and Stella begins. “We’ll be legend,” I say. I watch Stella as she lights up a cigarette and drops the Zippo on the dash. And then I know she knows. And I know she won’t stop me. Because this is the only way. “It’ll be very,” she says. I take a long drag on the cigarette and, still watching myself in the mirror, exhale slowly. Shouldn’t be smoking, I think. But what difference does it make now? I pass it back to Stella. Then I let the handbrake off and the car rolls forward. And secondly, doesn't that cover look gorgeous, and fit so perfectly with the other two... what do you mean, you haven't seen the other two?